Apple has officially launched the Watch Series 3 during its September 2017 keynote. The new Watch now sports LTE connectivity with a host of new fitness features and will be launching on September 15 with prices starting from US$329. At its September event, Apple announced that the Apple Watch is the most popular watch in the world and finally revealed the all new Apple Watch Series 3. As speculated earlier, the Apple Watch Series 3 comes with built-in cellular connectivity and uses the same number as your iPhone. The new watch comes with a dual core processor, which Apple claims is a 70% improvement over the previous generation single core chip, along with a custom W2 Bluetooth/Wi-Fi chip and a barometric altimeter. The exact specifications of the CPU or the W2 chip were not provided. Instead of a separate antenna, the Watch Series 3 uses the display face as the antenna and cellular connectivity is provided by the eSIM. 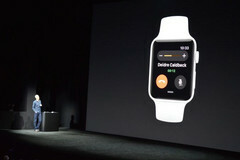 Apple demonstrated a live phone call over the AT&T network using the Watch Series 3 during the keynote. Apple claims that the Watch Series 3 comes with an all day 18 hour battery life. The Watch Series 3 runs on watchOS 4, which comes loaded with a slew of new health and fitness features. The heart rate app is being updated with new measurements such as resting heart rate and recovery heart rate. It will also notify users when it detects an elevated heart rate during periods of rest. The new heart rate measurement works together with Apple's Heart Study, which will use this data to analyze arrhythmia, in collaboration with Stanford Medical and the FDA. 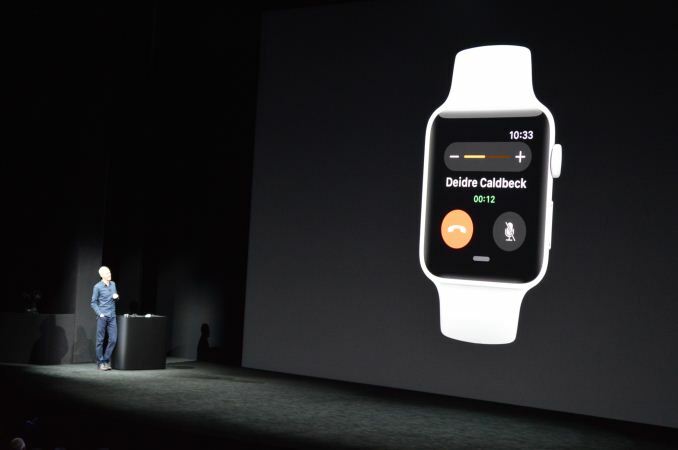 Also, Apple Music can now be streamed directly to the watch. watchOS 4 will be available for all Apple Watch customers on September 19. The Apple Watch Series 3 will be launching on September 15. The cellular variant of Apple Watch Series 3 will retail for US$399 while the non-cellular variant will retail for US$329. The first Apple Watch has also gotten a price cut and will retail for US$249. Broad availability commences from September 22.